The fall of the Berlin Wall and the unification of East and West Germany in 1989/90 were events of world-historical significance. The twentieth anniversary of this juncture represents an excellent opportunity to reflect upon the evolution of the new Berlin Republic. Given the on-going significance of the country for theory and concept–building in many disciplines, an in-depth examination of the case is essential. 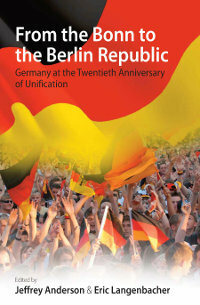 In this volume, unique in its focus on all aspects of contemporary Germany - culture, historiography, society, politics and the economy - top scholars offer their assessments of the country’s performance in these and other areas and analyze the successes and continued challenges. Jeffrey Anderson is Graf Goltz Professor of Government and Director of the BMW Center for German and European Studies, Georgetown University. He is an expert in European politics, with special emphasis on the European Union and postwar German politics and foreign policy. Recent publications include, The End of the West? Crisis and Change in the Atlantic Order (edited with G. John Ikenberry and Thomas Risse, Cornell University Press, 2008); German Unification and the Union of Europe: The Domestic Politics of Integration Policy (Cambridge University Press, 1999). Eric Langenbacher is a Visiting Assistant Professor and Director of Honors and Special Programs, Department of Government, Georgetown University. He did his graduate work in the Government Department and Center for German and European Studies at Georgetown, completing his Ph.D. with Distinction in 2002. Recent edited publications include Launching the Grand Coalition: The 2005 Bundestag Election and the Future of German Politics (Berghahn Books, 2006) and Power and the Past: Collective Memory and International Relations, with Yossi Shain (Georgetown University Press, 2010). Chapter 12.Is There a Single German Party System? Chapter 13. Higher Education in Germany: Fragmented Change or Paradigm Shift?